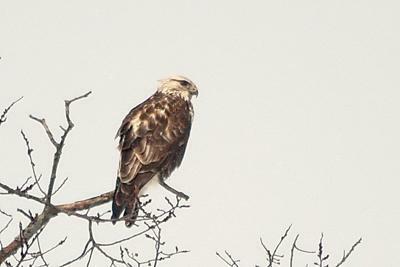 A 3 year old Bald Eagle was seen in a rare old Elm. It was -7C and snowing lightly; the snow is evident in the flight photo. The feathering changes until adulthood are complex and I needed some research to determine what I had photographed. I think that the mild winter and open water on the Maitland River is responsible for the Bald Eagle sightings in my area this February 2012. Wow, thank you so much for your beautiful pictures, they are amazing! 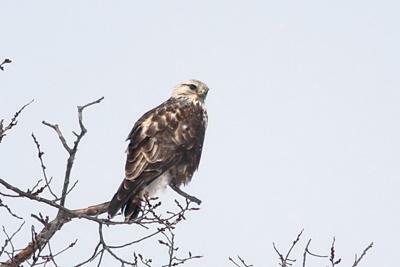 I'm no expert on Birds, but your fella looks a little like an Osprey, I'm not sure, with the stripe over they eye, and the dark patches under the wings, but I bet one of our readers would know for sure. Whatever this is, your pictures are lovely and I thank you for sending them to us! 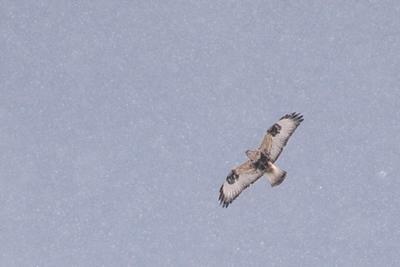 100% that is a Rough Legged Hawk. The bill on that bird is too short to be an eagle. It looks like a light phase of a hawk to me. Google "aging bald eagles". Interestingly, 3 year olds often have an eye patch similar to the Osprey. 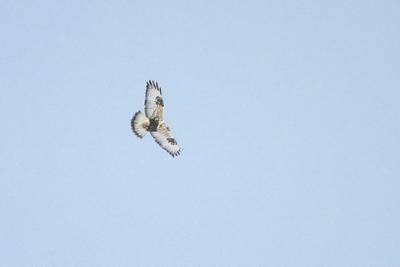 AES PS-these birds are very impressive and 2 to 3 times bigger than an Osprey. So glad you had your camera handy ...thanks !